For David Wilson in June 1989 the question was whether he'd sign, not whether he'd healed, according to the Cal Poly Mustang Daily. His arm healed, he told The Daily. He just had to wait for the Tigers to make their best offer. 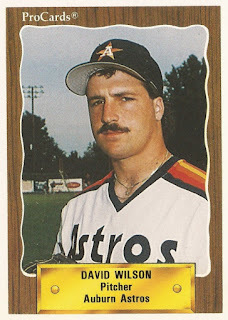 "I was throwin' a hell of a lot this year," Wilson explained The Daily after the Tigers took him late. "I wasn't poppin' the ball. I was about 90 percent at the end, but I'm back now. I've had about a week and a half rest since the series, and I'm ready to go." Wilson eventually did sign that year, but his career ended up being brief. He played three seasons. He never made AA. Wilson's career began that year, taken by the Tigers in the 31st round of the draft out of Cal Poly San Luis Obispo. He's also credited as Dave Wilson. At Cal Poly, Wilson led his team with a 3.37 ERA in 1989 and 131 strikeouts. He also pitched 125 innings. He played his first year at short-season Niagara Falls. He got into five games in relief, giving up 17 earned in 12.2 innings. Wilson then moved to the Astros system, signing there and playing 1990 at short-season Auburn. He got into 22 games there, starting eight. He picked up four wins and posted a 2.70 ERA. His final season came in 1991 at single-A Asheville. He went 1-9, with a 5.44 ERA over 22 starts, ending his career.